Modals Modals simplify the user interface and provide a way for the user to access additional information and interaction without leaving current page. They are used as an effective technique to focus the user’s attention on a particular piece of important information. 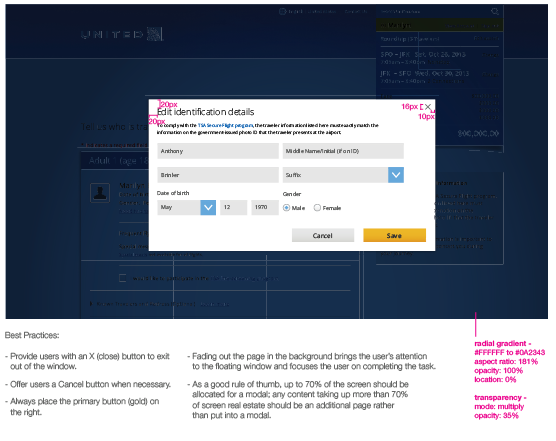 Most overlays are containers of information placed on top of the users current screen, with a separator between the two. Tool tips and coach marks Tool tips and coach marks are types of overlays that provide a way for the user to access additional information and interaction without leaving current page. They are used as an effective technique to focus the user’s attention on a particular piece of important information. 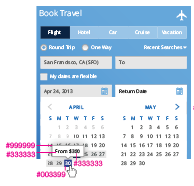 Tooltips are small, contained messages that appear when the user hovers, taps or clicks on a link or an indicator (i.e. question mark bubble). They provide the user with a brief explanation or tip about the object or control that they are interacting with. Tooltips are especially helpful for new users. Coach marks, another type of overlay, specifically guide a user by pointing out a control/interaction. They shortcut the cognitive processing a user performs when looking at a novel interface. Coach marks are especially useful to users as they help to introduce new interface features or demonstrate additional functionality is available. Calendar The use of the calendar allows the traveler to select their departure and arrival date without having to leave the current screen. Once the user selects their departure date, the return module is activated and ready for selection. 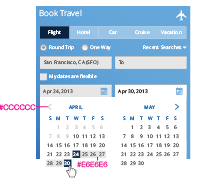 If a date is needed to be changed, all the user has to do is reactive the desired field. 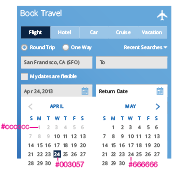 Fare calendar The Fare Calendar allows the traveler to select a departure date and arrival date base on price when booking their travel. 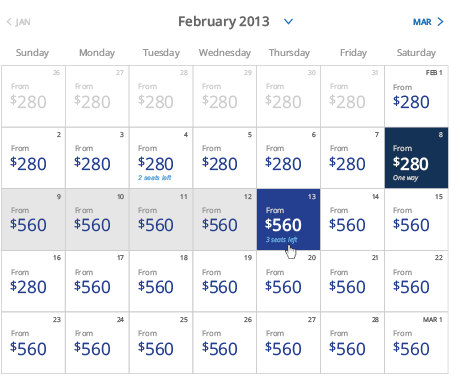 This function also allows the user to choose month, date and price point for each section of their travel.